I cannot say enough about the amazing experience of training 53 nurses and health staff last week on the use of birth kits and WHO’s Essentials of Newborn Care. The Yale Nursing team did an amazing job of teaching the latter, which adds so much to the hygienic birth promoted by the birth kits. It was a perfect match! We used role play extensively in the training: modeling and then giving extensive time for hands on practice. We learned so much from the 18 returning nurses and health staff about how the kits are working in the field. Add gloves to the kits. These will NOT be for clean hands – we will still provide soap and clean picture instructions for cleaning hands throughout the birth process. Instead the gloves will be used to help overcome the specific taboo against touching the blood of the mother/baby. The gloves will thus be a tool for encouraging mothers to have a partner at birth. Add another absorbant sheet for wrapping newborn to the kits. This was much asked for and dovetails nicely into the Yale Midwives teaching about WHO’s Essentials of Newborn Care. Keep the cord clamps (not cotton ties) in the kits – add a second clamp. The plastic clamps are working once people get enough education about how to use them. The second clamp is needed because mothers usually tie off two place (mother and baby). Extend education beyond the mom. Have partner present during the education and at the after birth interview. This way, the laboring mother, is not the only one responsible for making sure birth is hygenic. Continue to train Village Volunteers but have nurses hand out the kits and do the interviews. When nurses visit the villages every 1-3 months they will distribute kits and interview mothers who have used the kits. This is better than the Volunteers, who are often not literate, tracking the kit usage. 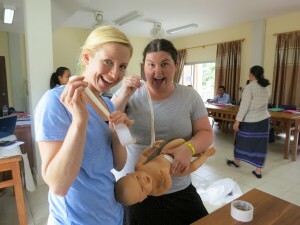 In addition to practicing the use of birth kits, we spent time reviewing the data collection procedures. Due to erratic reporting, we decided that our partner organization will contact each nurse on the 1st day of the month and 5th day of the month via calls and texts. If no news by Day 7, the small stipend of $4 per month will be withheld for that month. Success! It was a great training, thanks to the wonderful organization of our Lao partner’s staff, to Cele, Lizzie, and Hannah, from the Yale School of Nursing, and the excellent participation of the local nurses! So exciting to see the project growing! !